Security: Protecting oneself and family. Method of guarding our community, its assets and equity. Protection from predators, from plunderers, from thieves, from bullies and those who deprive. Protection from natural disasters. Security guarantees survival. There is no security in weakness. Security sustains prosperity. Our basic right to Security ranks up there with sustenance, shelter and propagation. During simple times when weapons of mass destruction and guns were not yet invented, it was with pride that every household possessed weapons; weapons that can defend, keep the peace, commit crime or whatever the user may want his weapon to be used for. As civilization prospered and got more sophisticated, governance decided to control the number and types of weapons possessed by their citizens. .
Government became in charge of security and the responsibility for securing the peace in the community became the responsibility of the government. This is a good thing because security guarantees survival. There is no security in weakness. Security sustains prosperity. We need to embrace respect and kindness. Parents must teach this. The school system must teach this. Government must embrace this. Security is the right of every individual. It is not an inherent government right, it is an inherent individual human right. It must never be taken away from him. Those who want to stay in power and simply want others to practice tolerance, always insist on the transparency of security. Transparency destroys security. The strength of security relies on privacy and secrecy. Do not Cheat. Do not Insult. Love but never deprive, share and be balanced and you will be ENLIGHTENED. Love is the ultimate miracle word. It is the “cure-all”. This leads to inner peace and enlightenment. This is a very elusive goal. Love is instinctive. Every soul embraces love. However, instinctive love is limited. Rarely does it go beyond self, a friend, a loved one or family. Love for others (strangers, country, the environment, and the universe) is learned. It is philosophically embraced by most people but rarely acted upon. All over the world, you will hear great leaders, guardians, parents, pastors, priests, imams and wise-men preach about the fear of God, about love, about tolerance and about kindness to attain peace. For thousands of years this same “routine” is laid out at homes, places of worship and institutions of learning. But the “routine” of preaching love, tolerance and kindness hasn’t achieved the desired “peace on earth and goodwill to men”. Love is still the ultimate key. But as explained previously, instinctive love is limited. Guiding instinctive love towards universal love is a must but so few are taking the correct path towards it. The switch must be made universally. Start by teaching respect and emphasize on the GIVING of respect rather than on expecting respect or teaching that respect must be earned. From this juncture work towards kindness, universal love and enlightenment. The greatest force that keeps us in darkness is cheating. We lie. Then we begin to believe in our own lies. The first step to enlightenment is to stop lying to ourselves. By accepting our past, we accept the truth. Learn from the past(truth), this will allow us to know and respect ourselves and bring us closer to enlightenment. The enlightened person has inner peace. He is at peace with the universe. The power of the universe can be tapped by every man through Qi (Chi or Ki). Train and prepare yourselves not to be “accepted” but to be as one with the universe. Live your eternal life (corporeal and spiritual), love, share, prosper and be happy. Listen. Quietly listening can work wonders. Listen to the person who wants to be forgiven. Learn to accept an apology without bitterness. Forgiveness opens the path to better and meaningful communication. Learn to forgive yourself. Give yourself a chance to improve and be a better person. When an individual deprives another or himself and in the process hurts himself or the other person, retribution is usually sought after by the person who is hurt. Retribution is not only outwards, it can also be inwards. People hurt themselves because of guilt. 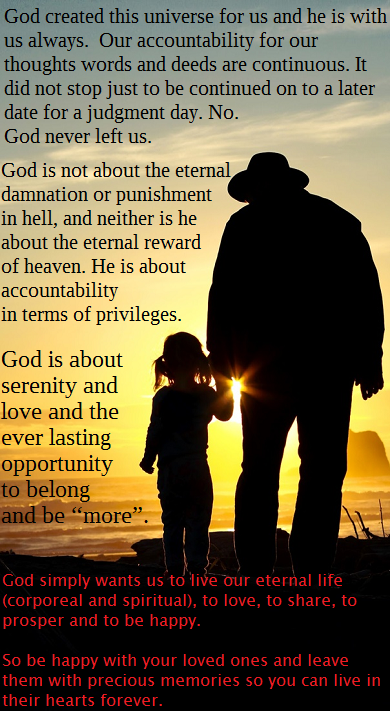 However, retribution can be averted through forgiveness via atonement or repentance for the violation(s) committed. The inability to forgive is caused by disconnection. The law of the universe listens to “apology” and our ability to forgive. Our inability to apologize or forgive will only create the same results for our actions. We will be accountable or answerable for all our thoughts, words, and deeds. Don’t be a bully. Teach the children to give respect and not simply to expect it. Teach them not to cheat, not to insult and not to deprive. When at fault, learn to apologize. An apology can melt a heart of stone. While in this world, there are rules and laws that demand to be followed. Your obligation or responsibility becomes your covenant. Disobedience of the rules and laws and your failure to comply with your covenant can lead to severe consequences or accountability. Accountability is not simply for our corporeal life. We will also be accountable in the after life. Accountability does not simply apply to the negatives that we have done, it is also for the positive things in our life. Your good thoughts, words and deeds will be rewarded. Anytime you follow, lead or forge the path for the positive, good things will always happen to you. How can I be accountable for my thoughts? I am not harming anyone, you conclude. I am just thinking about it, you say. Your random thoughts will eventually lead to a firmly held opinion or conviction. It becomes your belief, your cornerstone, your advocacy or your faith. These are the thoughts that you will be accountable for. Our accountability for our thoughts words and deeds are continuous. It did not stop and to be continued on to a later date for a judgement day. No. God never left us. Through the generations and in many cultures there are sayings of “you reap what you sow”, “Karma”, “what goes around, comes around”. The path we take here in this universe will be the path to our spiritual state. Every moment through your journey in life, you create paths of “to and from”. Every time you reach for something (positive or negative), you create a permanent path or bridge back you. The Positive or Negative may travel those same paths that you have created in your life in either way. When you come across an unavoidable situation, use prudence to work around it. If it requires inaction, then refrain but if you must act then do so rather than live to regret about it. To hold someone accountable requires prudence whether it is for the accountability of what is good or bad. The law of the universe listens to “apology” and to our ability to forgive. Our inability to apologize or forgive will only create the same results for our actions. These are all about accountability. What a great way to calm down an angry person. Apologize for your mistakes. Make your apology and mean it, without any “buts” in your sentence. Do not make excuses. Learn to apologize sincerely. Apologize even to the child that you just took for granted. Apology is a great exercise in humility. It is difficult to apologize when you are vain. An apology shreds vanity. Do you think that confession or repentance will automatically lead you to forgiveness? You can internally feel sorry, repent or feel total remorse for your thoughts, words, or deeds but unless you externalize this to the one you have deprived, insulted or cheated, who are you fooling? What if none of those who were offended or violated are around or to be found? Then make your amends by being kind to humanity or to the universe in their honor. There must always be ACCOUNTABILITY. NOTE: Print a PDF copy of this post. The skill, ability, or wisdom to avoid conflict and choose what is right and what is good or beneficial to humanity. Be sensitive to the feelings of children. Your tone of voice will make or break them. Be nice. Never discourage anyone from doing anything that is not detrimental or harmful to anyone. Along the way while doing these activities although mundane and possibly unproductive to the observer, a person may learn something good. “Everyday this woman throws her dirty water in the same place and makes a muddy area. While just a few feet away there are plants withering. Was she doing something bad? No! Guidance and not Criticism. PRUDENCE. Tolerance towards the bad behaviors and actions of others will be the demise of governments, communities, institutions and families. Bullies multiply when you practice tolerance. OTHERS telling you to TOLERATE. Why? ✅ They have the upper hand or the advantageous position. ✅ They are the bullies, the users, the abusers, the pushers. ✅ They impose their will or opinion upon you. They deprive. ✅ They make you accept what is unfair, unjust or wrong. ✅ They want you to be submissive and to leave it to God. ✅ They tell you to “turn the other cheek” or be “politically correct”. ✅ They allow others to take what is yours and tell you that it is OK. If YOU choose to TOLERATE. What is the implication? ✅ There is a bully or an abuser. ✅ There is someone or something you just do not like but you find him/her or the situation still useful to you. ✅ You can’t win yet. You are not getting what you want. You wait for the opportunity to break away to be free or to conquer. ✅ You have accepted defeat, you gave up and chose the life of servitude. Teaching tolerance does not win the fight against hate, bias, and prejudice. To be an agent for a prosperous and responsible change, the school system must teach and put emphasis on respect, kindness, gratitude, apology and forgiveness. Teaching tolerance creates a subservient individual. Primed as an easy victim for those who deprive, cheat and insult. The bully learns from those who teach tolerance. He/she learns how to manipulate the new submissive ways that his/her victims have learned from their teachers. If you tolerate or put up with the bully, then for sure he/she will continue to antagonize, rile, vex, deprive and take advantage of your situation. 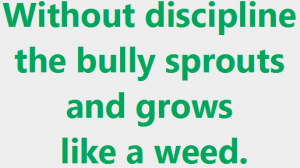 Without discipline, the bully sprouts and grows like a weed. Preaching the freedom of choice and preaching tolerance goes hand in hand. They teach you that submission is the way to peace. Yes, the peace in a society where they impose and you willingly choose to obey, thereby creating no conflict for them. There is no cooperation in tolerance. The people who want you to tolerate their impositions, say there is. The people professing tolerance identify the word with courtesy and appreciation. They also identify the word with patience. There is a fine line between patience and tolerance. Patience carries the ingredient of love whereas, tolerance does not. A nurse may tolerate the ornery patient because that is her job. However, the wife of the ornery patient has patience because she loves him. You can choose to tolerate the behavior of your companions or your community. That is your right. However, never ever make the mistake of identifying tolerance for respect or kindness. Do not mistake diplomacy or being patient and cordial for tolerance. Do not mistake a negotiated truce for tolerance. Tolerance has its place. There is a time for it. But continued tolerance is cowardice. On the other hand, tolerate if you must, until you are able to negotiate a truce or fight back. Fight, not because you hate or you are hated, fight because you are defending and protecting what and who you love and respect.